Name tags are all about visibility. And without the right fastener, name tags can’t reach their full potential! 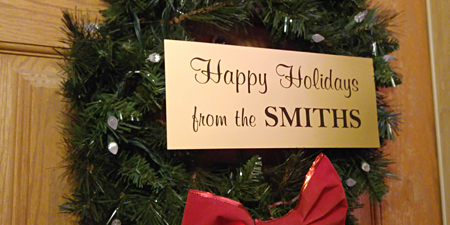 From adding a logo to the right custom text, name tags are important to everyone. While most name tags are simple enough to feature a name and some company branding, they should also feature a fastener that will aid in the name tag’s presentation. Branding is one of the most important things for businesses, and keeping a name tag visible helps to maintain that hard work. So, after choosing the right name tag for your business or organization, here are some tips for choosing the right fastener for those name tags. The most traditional choice for a name tag fastener is a simple pin. Pin fasteners are sufficient to get the job done. However, putting a pin through clothing may be an issue for someone who wears a thin fabric or doesn’t want a possible hole forming. Keep in mind that pin fasteners are quite efficient, inexpensive and super easy to use! 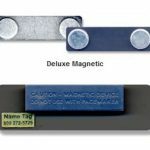 Our most popular fastener choice is the deluxe magnetic fastener. This fastener consists of two parts. 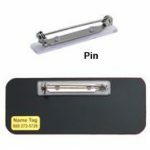 A metal plate with indentations, which holds the magnet in place and adheres to the back of most name tags, and a plastic bar that holds two strong magnets, which holds in place through multiple layers of clothing. Please also remember to never use magnets with a pacemaker. 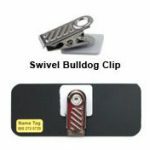 Swivel bulldog clips are a less expensive alternative to magnets that don’t require poking holes in clothing. These fasteners are also great on photo ID badges and are frequently used with lanyards. The clip can attach to a pocket or a shirt collar for quick and easy use. Two pins are better than one, right? 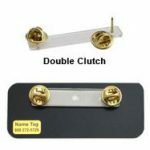 Double clutch fasteners are a military style fastener that will keep your name tag in perfect position. With the two pins holding it fast to whatever you are wearing, that name tag isn’t going anywhere! Talk about visibility! A plastic strap is attached to a bulldog clip and then runs through a slot punched in your name tag. The clip is attached to the back of a tag and then slipped onto the top of a shirt pocket. These bulldog clips with pin fastener allow the wearer to choose between the clip or pin fastener. 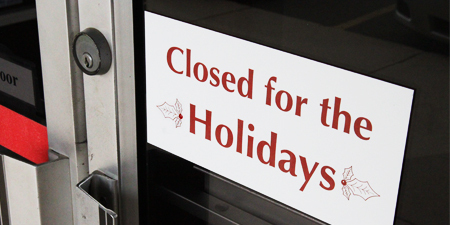 Your fastener choice will impact the name tag’s appearance, so choose carefully. Don’t make this decision too quickly. Make sure to weigh all possibilities before adding a fastener to your order. And, as always, if you need help, give us a call!